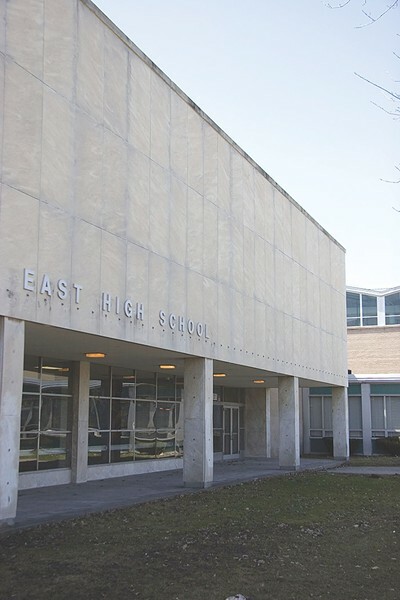 Imagine East High School with a 95 percent graduation rate. Imagine walking through the front doors without having to go through metal detectors. Imagine a school so popular that there’s a waiting list to get in. That’s a sample of the ideas that surfaced yesterday at the University of Rochester Vision Summit. Others included college tuition assistance, hallway walls that prominently display East’s alumni, and a dynamic and inspirational environment. UR Professor Steve Uebbing, Rochester school board President Van White, and East Principal Anibal Soler coached everyone who attended the summit on the value of having an end goal in mind: a fairly literal concept of what East will be in a few years from now. The UR agreed to partner with the district to transform East. A partnership is one of the options that the State Education Department allows to fix a failing school. The UR's Warner School is in the planning stages and will assume management of the school next year. But attendance at summit was lacking. The UR, according to one teacher, planned for 200 people to attend, and about 40 showed up. Roughly a dozen of them were from the UR. Uebbing and White expressed their disappointment in the turnout, but White later said that he wasn’t surprised. Some school officials attributed the low attendance to a lack of publicity about the event. Information is on the website, however: www.ureasthigh.org. Lack of transportation and competing school events may have also contributed. The school board has approved adding more social workers and six parent advocates to reach out to families near East, as well as the creation of a family resource center at the school. Whether those steps will help to foster greater family and community engagement is hard to say. But East won’t transform for the better just because the UR is involved; Uebbing said as much in his opening statement. And even though White has been tenacious about turning East around, it’s ultimately not up to him.